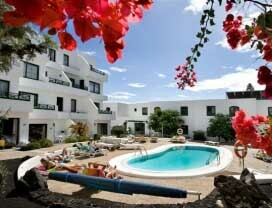 Address: Guadarfia, 1, Puerto del Carmen (Lanzarote), Islas Canarias. Apartamentos HG Lomo Blanco are located just 200 metres from the Playa de Puerto del Carmen Beach on Lanzarote’s south coast. The complex has 2 outdoor pools with loungers. All the Lomo Blanco apartments have a twin bedroom, bathroom, kitchenette and living room with sofabed. Each apartment has a terrace or balcony overlooking the gardens. There is also satellite TV. A safety box and WiFi are available for an additional charge. Lomo Blanco Lanzarote has a restaurant, which serves a variety of fish, meat, pasta and vegetable dishes. There is also a café-bar. The aprthotel has a games room with table tennis, as well as a massage service. It is also possible to rent a car at the front desk. Puerto del Carmen old town, along with a variety of shops, restaurants and banks is only 700 metres away, and there is a shopping centre 300 metres away. Lomo Blanco is 10 km from Arrecife Airport. Please inform Apartamentos Hg Lomo Blanco in advance of your expected arrival time. You can use the Special Requests box when booking, or contact the property directly with the contact details provided in your confirmation. Please note that payments made with American Express carry a surcharge of 3.5% per transaction.